Having developed a liking for the music of Italian composer Stefano Giannotti, and having reviewed his band OTEME’s L’Agguato, L’Abbandono, Il Mutamento some eighteen months ago, it was a nice surprise to receive a copy of his latest collaboration in the post quite a while ago now. Like the OTEME album it has sat neglected for far too long before I plucked up the courage to write about it. It seems Stefano’s work fills me with dread in anticipation, but I really do not know why I have this weird perception of Stefano’s ultimately gentle muse. All I can offer are my humble apologies for not getting around sooner to giving his work the attention it deserves, but my mojo had gone astray for a while, that’s at least part of the excuse! Stefano is most certainly a forward thinking composer, and I just knew that contained within the zeros and ones within this shiny disc would be some of the most adventurous music I would hear this year. 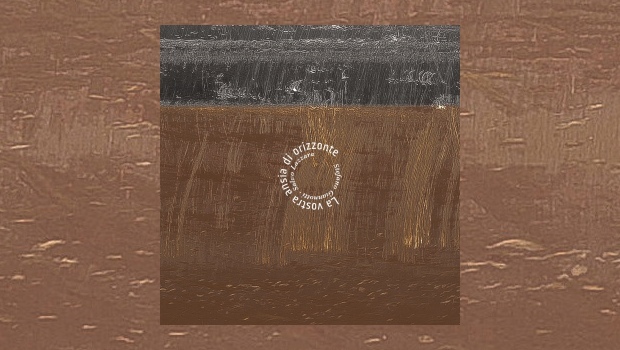 I was not disappointed, for La vostra ansia di orizzonte (‘Your anxiety of horizon’) is not only adventurous, but it shimmers with an otherworldly, almost folksy beauty. The album came together after Stefano was sent some files in 2015 by guitarist Salvo Lazzara, known for his work with progressive rock band Germinale, and more recently as solo project Penserio Nomade, with the attached request for Stefano to work on his new album. The files were much different to what Salvo was doing as Penserio Nomade, covering all bases from ambient, to psychedelic, and free form noise. That might not sound too appealing but what the pair have conjured from that basest of material is the end result of musical alchemy writ large. Opening track L’alba di una rosa features introspective untreated 12-string electric guitar backed by what could be recorded rainfall, that devolves into a simulation of the random scratches on a vinyl record, it soon becomes apparent that the found sounds and electronic manipulations are as important as the traditional instrumentation on this singular but fascinating album. I particularly liked the treated cat’s purr during Ma tu dov’eri? …or is it an idling motorbike engine? This tactic of sounds just beyond definition assists the listener’s imagination as it creates abstract paintings in the mind’s eye. Another sequence during this long piece that ends the album sees Salvo’s guitar doing a more than passable Miles homage, with harmonics and melodies flying up and down the fretboard, in call and response to Marco Fagioli’s trombone. Some really fine trumpet work from Luca Pietropaoli over all manner of odd watery percussive noises and more unidentified flying found objects dominate the larger proportion of the mid-section of the piece before Salvo’s guitar scratches plaintively at the back door, a cat crying to be let in. Eventually it gets on that motorbike and rides off into the sunrise. Possibly the most engaging section of this album is Dune d’acqua I & II (see video above), the first part just Stefano’s heartfelt voice accompanied by his ukulele, the tune then expanding with the incoming tide in part II. Quite lovely. Elsewhere we a have a touch of Faust-like piano experimentation, ambient soundscapes, abstract scientific description sung as a ballad by the elfin-like Lucia Pera, and the title track eventually works a conventional electronic rhythm out of sampled and looped pigeon cooing, something that admittedly looks odd on written down, but works well, trust me! The subtly tasteful tri-fold out CD cover contains a booklet (remember those?) that offers translations of all the track titles and credits for each track, in addition to the text in the original Italian. This is particularly useful where Onde di terra is concerned, consisting as it does of Stefano’s thoughtful and poetic lyric recited rather than sung, to the backing of plaintive banjo and soulful harmonica. Avant-blues, if you will! This is experimental music that goes well beyond being wilfully odd to create a genuinely engaging soundscape that achieves its goal of agitating the grey matter beyond mere passive acceptance. If you have an adventurous musical spirit, you need to hear this.